Plesiosaurus brachypterygius, a prehistoric Loch Ness Monster, roamed the seas 135 million years ago. All members of this species are now extinct with the rest of the reptilian behemoths from the Jurassic Period. 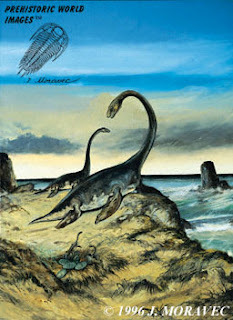 They live on through an impressive Plesiosaurus Art Print created by Josef Moravec, a world-renowned paleo-artist, whose works are displayed in Museums of Natural History throughout Europe and North America. It depicts the fearsome primeval predators resting on some rocks while watching over their young. The Plesiosaur, which name means "near lizard", is a predatory marine reptile with a long neck, four flippers and a tail. It grew up to 16.5 feet long from head to tail. It propelled itself lithely through the water to prey on fish with its long neck, wide set of jaws, and interlocking razor sharp teeth. It is believed to have fed by trapping its prey in its mouth then swallowing it whole. Though it had advantages of camouflage, maneuverability, and flexible sight, it was most likely preyed upon by some of the larger marine predators of the Jurassic, such as the Liopleurodon and Kronosaurus. The Plesiosaurus became perhaps the first fossil reptile ever seen by British scientists in 1821, making them aware of the enormous reptiles that inhabited our world millions of years before the first human. Josef Moravec's fascination with the beauty of the prehistoric world motivated him to create such works as the Plesiosaurus Art Print. He strives to recreate the prehistoric world, as it truly existed, based on his education in paleontology; for example, the way the Plesiosaur young are shown in a nest in the sand like sea turtles, who come onto land to lay their eggs today. This is the most current theory on the method of reproduction of Plesiosaurs by paleontologists. The flippers of the predator are portrayed realistically as powerful. Paleontologists believe the Plesiosaurs flapped their paddles up and down to propel it, giving them the appearance of flying through the water. The Jurassic Period, ranging from 200 to 145 million years ago, was a time very different from that of our own. The warm humid climate allowed dense jungles to cover much of the landscape. The world was dominated by large sauropods such as Diplodocus and Brachiosaurus, which were in turn preyed upon by theropods such as the Allosaurus and Megalosaurus. Hulking reptilian leviathans like Plesiosaurs and Ichthyosaurus wandered the seas. Plesiosaur fossils have been found mainly near England, Germany, and East Africa, though some American species are know as well. Through the remaining fossilized skeletons of these archaic hunters, paleo-artists like Josef Moravec are able to recreate the ancient lost world of the Jurassic Period.